I have always been a fan of the painters Wayne Thiebaud and Paul Wonner. They both glorify everyday objects and lift them, through their vision and skill, to the heights of art. Such was the inspiration for my image, shot and submitted for today’s Daily Photo Game. Robert’s cool image “Shruburbia” gave me the numerical beginnings of my image, the count of four. 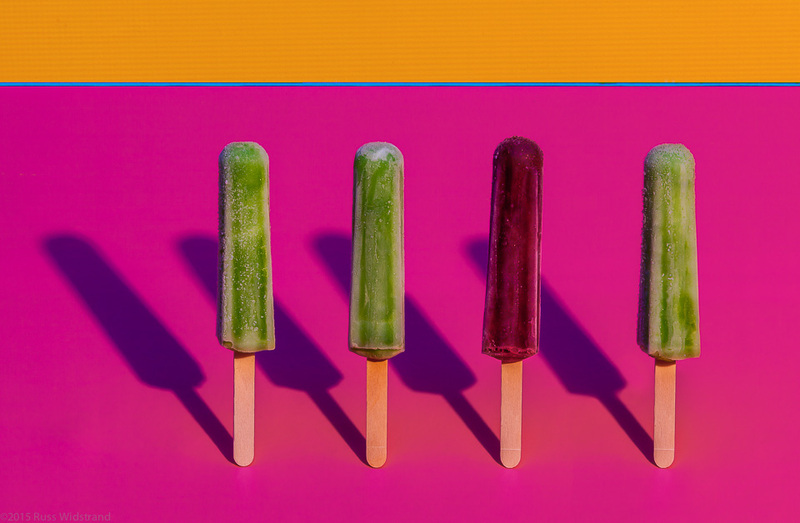 Add to that, the 102º heat wave this weekend in Portland and what better way to cool down than with an ice cold popsicle. This childhood treat brings me back to my youth and their playful colors dovetailed nicely into my vision for this pop art image. A quick run to the fabric store for some bright vinyl, build and light the set and cajole the unruly popsicle to stand upright… stay popsicle, stay. Of course, there is the melt factor. As is often the case with art, my initial notion of 4 similar colored popsicles was not to be, they melted by the time I got this figured out. So onto the backups, these green one’s and the twist of the one, off-colored treat… as a bit of whimsy. It was not until I viewed Robert’s and my image together that one can see the happy accident of how these two images mimic each other in pattern. Photographers note: The proliferation of digital cameras, the internet and social sharing, devalue the earnest work of professional photographer’s efforts… we get lost in the deluge of cat videos and pictures of lattes. Sharing snapshots, no matter how pretty or engaging, hardly compares with the dedication to concept, executed under deadline, and created in thoughtful conversation with a another work of art. Such is the process we ten photographers of the Daily Photo Game engage in daily and I hope you would take a minute and help by liking, commenting and sharing this image with your network. Much appreciated.